(with J. Žganec Gros, T. Domajnko, T. Majcen, M. Ivančič, A. Mihelič, Ž. Golob, P. Brajak, N. Planinc) Advanced voice-enabled e-health services. Informatica medica slovenica, 2011, Vol. 16, No. 1, p. 13 - 21. Delež minimalnih parov besed med besednimi oblikami in lemami. Jezikoslovni zapiski, 2009, Vol. 15, No. 1-2, p. 87 - 94. Večjezični utrinki iz evropske zakonodaje. In: I. Novak-Popov (ed.). Slovenski mikrokozmosi - medetnični in medkulturni odnosi, (Zbornik Slavističnega društva Slovenije, 20). Ljubljana: Zveza društev Slavistično društvo Slovenije, 2009, p. -104. Trubarjeve vzporednice / Pismenost nekoč in danes. Stati inu obstati, 2008, No. 7/8, p. 100-107. (with M. Michelizza) Besedilni korpus Nova beseda. Mostovi (Ljublj. ), 2007/08, Vol. 41, No. 1/2, p. 165-176. (with A. Žele) English anchors in a Slovenian word resource. In: M. Davies (ed.). Proceedings of the Corpus Linguistics Conference, CL2007, University of Birmingham, UK, 2007, [7 p.]. (with J. Žganec Gros and V. Cvetko-Orešnik) SI-PRON pronunciation lexicon : a new language resource for Slovenian. Informatica (Ljublj. ), 2006, Vol. 30, No. 4, p. 447-452. On text corpora, word lengths, and word frequencies in Slovenian. In: P. Grzybek (ed.). Contributions to the science of text and language : word length studies and related issues (Text, speech and language technology, Vol. 31). Dordrecht: Springer, 2006, p. 171-185. (with B. Loenneker) Checking POSBeseda, a Part-of-Speech tagged Slovenian corpus. In: Tomaž Erjavec, Jerneja Gros (eds.). Proceedings of the 7th International Multi-Conference INFORMATION SOCIETY IS 2004, Jožef Stefan Institute, Ljubljana, 2004, ISBN 961-6303-64-3, p. 48-55. (with B. Loenneker) XML version of the Nova beseda text corpus. In: Ogrin, Matija (ed.). Znanstvene izdaje v elektronskem mediju : večdisciplinarno posvetovanje, Ljubljana, 2. junij 2004 : povzetki referatov. Ljubljana: ZRC SAZU, 2004, pp. 33-34. The possible and actual size of Slovenian wordform vocabulary. In: NOVAK, France (ed. ), ŽELE, Andreja (ed.). XIII International Congress of Slavists, Zbornik povzetkov. Ljubljana: ZRC SAZU, Založba ZRC, 2003, part 1, p. 235-236. Entropija v slovenskih leposlovnih besedilih [Entropy in Slovenian Literary Texts], (Zbirka Linguistica et philologica). Ljubljana: ZRC SAZU, Založba ZRC, 2002. V, 208 pp., ISBN 961-6358-77-4. The feasibility of a complete text corpus. In: RODRÍGUEZ, Manuel González (ed. ), SUAREZ ARAUJO, Carmen Paz (ed. ): Third international conference on language resources and evaluation, Las Palmas de Gran Canaria (Spain), 29th, 30th & 31st May 2002. LREC 2002 : proceedings. Gran Canaria: European Language Resources Association, 2002, vol. 2, p. 437-440. Distance beetween languages as measured by the minimal-entropy model; Plato's republic - Slovenian versus 15 other translations.Int. j. corpus linguist., 2001, vol. 6, special issue, p. -53, tables. Words and nonwords as basic units of a newspaper text corpus. In: 6th Conference on Computational Lexicography and Corpus Research "Computational Lexicography and New EU Languages", Birmingham, 28 June-1 July, 2001. COMPLEX 2001. Birmingham: Centre for Corpus Linguistics, Department of English, University of Birmingham, 2001, p. 49-65. Beseda : a Slovenian text corpus. In: FRASER, Michael (ed. ), WILLIAMSON, Nigel (ed. ), DEEGAN, Marilyn (ur.). Digital Evidence : selected papers from DRH2000, Digital Resources for the Humanities Conference, University of Sheffield, September 2000, (Office for Humanities Communication publication, 14). London: Office for Humanities Communication, 2001, p. 229-241. Plato's Republic: Part-of-speech Comparison of English, German and Slovenian Translation. Proceedings of the third TELRI seminar: Translation equivalence / Montecatini. Mannheim 1998, p. -102. Besedne zveze iz Nove zaveze [Word collocations from the New Testament]. Delo. Vol. 39/31.XII.1997, p. 69. (with A. Musar) Kvantitativni prikaz prevoda zbirke zgodb Alica v čudežni deželi [Quantitative Description of the Slovenian Translation of Lewis Carroll: Alice in Wonderland]. Slava, 1996/97, 2, p. 135-142. (with M. Snoj) Wie kann der Computer bei der Abfassung eines etymologischen Wörterbuchs von Nutzen sein [A Case of Computer Use in Compilation of an Etymological Dictionary]. Akten der 4. Internationalen Arbeitstagung für Computereinsatz in der Historischen Sprachwissenschaft / herausgegeben von Heiner Eichner und Hans Christian Luschützky. - Prague : Enigma corporation, 1997. - (Studia Iranica, Mesopotamica & Anatolica ; 2/1996). .- p. -174. (with A. Bizjak) Part-of-Speech Tagging in the Slovenian Translation of Plato's Republic. TELRI Newsletter 5 (April 1997). Politika, besedilne podatkovne zbirke in računalniki [Politics, Secret Archives and Computers]. Slava, 1996/97, 1, 87-95. Ali so rojstna imena krajša od drugih samostalnikov? [Are Personal Names Shorter Than Other Nouns]. Slavistična revija. Vol. 44/2, 1996, p. 193-200. (with M. Hajnsek-Holz) Odzadnji slovar slovenskega jezika [Reverse Dictionary of Slovenian Language]. ZRC-SAZU, Ljubljana 1996, 860 pp. EVA - A Textual Data Processing Tool. Proceedings of the first TELRI seminar: Language Resources for Language Technology, Tihany 1995. Nekaj številk iz Slovarja slovenskega knjižnega jezika [Some Figures from the Dictionary of the Slovenian Literary Language]. Slavistična revija, Vol. 43/3, 1995, p. 341-375. O n-terčkih in o novem postopku za deljenje besed [On n-tuples and on a new method for word division]. TIP, Nr. 6, 1995, p. 38-40. (software author) Slovar slovenskega knjižnega jezika [Dictionary of the Slovenian Literary Language]. DZS, Ljubljana 1994, 1714 pp. [Short English-Slovenian and Slovenian-English Dictionary of Computing]. Cankarjeva zalozba, Ljubljana 1987, 226 pp. France Preseren vocabulary - rank frequency relationship. ROJP III, Bled 1985, p. 611-615. Modern Cave Photography - a Slovenian Viewpoint. O sodobni jamski fotografiji. Glas podzemlja, ISSN 1581-8942, april 2004, p. 27-52. (with A. Kranjc) Jamski kataster v računalniški obliki [Computerized Cave Cadastre]. Naš krš (ISSN 0351-1502), Vol. 10, 1984, p. 115-117. Caves, Volume and the Z80. New trends in speleology, proceedings, Dobrihovice 1983, p. 24-27. (with A. Kranjc) Informatisation d'un fichier de cavité, l'example de la Slovénie, Yougoslavie [Computerisation of Cave Cadastre, a Case of Slovenia, Yugoslavia]. Spelunca Mémoires (ISSN 0249-0544), Vol. 13, 1983, p. 35-36. (with I. Kenda, M. Kranjc, A. Kranjc) Krasoslovna zbirka podatkov [A Collection of Karstological Data]. Acta carsologica (ISSN 0583-6050), Vol. 12, 1983 (1984), p. 139-155. On Measuring Caves by Volume. Proceedings of the 8th international congress of speleology, Bowling Green 1981, p. 270-272. Macrostereological Evaluation of Cave Space. Proceedings of the 3rd European symposium for stereology, Ljubljana 1981, p. 621-628. O nekaterih pojmih v zvezi z jamskim prostorom. [Some Terms Related to Cave Space]. Glas podzemlja, Ljubljana 1979, p. 17-18. O numeričnem vrednotenju kraških objektov. [Numerical Evaluation of Objects on Karst]. Proceedings of the 6th Yugoslavian congress of speleology, Postojna, 1972, p. 41-42. (ed.) Planinska dolina : ljudje in kraji ob Unici. 1st edition. Planina pri Rakeku: Župnija, 2009, 296 pp. STEVE: Text, Graphics, Data Base, DeskTop Publishing and Computer Aided Instruction on ATARI ST. Ljubljana, 1989, 605 pp. (with A. Pavlin) IBIS, programski sistem za delo s podatkovnimi zbirkami spremenljivih dolžin [IBIS, software package for data of variable length]. University of Ljubljana, 1987, 43 pp. [INES, data-base, picture and text editor]. Ljubljana 1985, 68 pp. ; translated from English by Janez Kanič. INES, Information Editing System fuer den 48 K Sinclair Spectrum. Ultrasoft, Duesseldorf 1984, 24 pp. ; translated from English by Gitica Jakopin. 2012 Postojna, 2005 Ljubljana, Solkan, 2004 Zaghouan, Ljubljana, Laze, Postojna, Vipavski križ, 1994 Laze, 1979 Ljubljana, 1977 Bled. Born June 30, 1949 in Ljubljana, Slovenia in a linguistic family - father Franc was a professor of eastern Slavic languages with publications in the field of grammar and onomastics, mother Gitica has translated more than 50 novels from English, German, French, Russian and Polish to Slovenian. 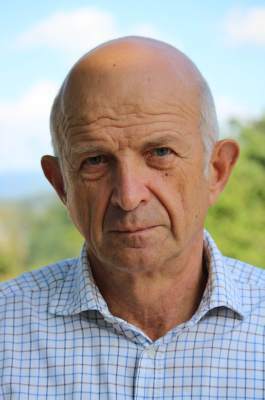 In 1972 he obtained a degree in mathematics at the University of Ljubljana, in 1981 master's degree in information sciences: Entropy of Names and Family Names in Slovenia at the University of Zagreb, in 1999 PhD: Upper Bound of Entropy in Slovenian Literary Texts at the University of Ljubljana. From 1972 to 1984 he constructed a numerical model for approximation and visualisation of caves on karst. It was used to compute the volume of several caves and collapsed dolinas in Slovenia; the results were reported at the 8th International congress of speleology and 3rd European symposium of stereology. 1974-1979 assistant for computer science at the Medical faculty, 1979-1986 responsible for the library information system at the University computing centre, 1986-1993 independent software developer, from 1993 to 2012 teacher in the field of computational linguistics at the Faculty of Arts, from 1989 counselor at the Slovenian Academy of Sciences and Arts; all in Ljubljana. From 2001 till 2012 head of the Corpus Laboratory at the Fran Ramovš Institute of Slovenian Language ZRC SAZU. Retired in July 2012. From 2012 to 2016 teacher of language technology at the School of humanities, University of Nova Gorica. Major pieces of software/lingware: STAT (Control Data Cyber, 1977), IBIS (Digital DEC 10, 1981), INES (Sinclair ZX Spectrum, 1985), STEVE (ATARI ST, 1987-1992), EVA for DOS, 1992 and Windows 9X/2000/XP, 1996-), NEVA - Windows server search engine, 1999-. From 1992 to 1994 he supervised the transfer of "The dictionary of the Slovenian Literary Language" from printed to electronic version (EVA OCR, DOS version). In 1997 he has written the first part-of-speech tagger for Slovenian texts (hit rate 80%) and in 1998 the second one (hit rate 92%). In 1999 he started an Internet text corpus, with a concordance service and linked wordform and reversed wordform frequency dictionaries. It is now available as Nova beseda. He speaks English, reads German, French, Italian, Spanish, Russian and Czech.